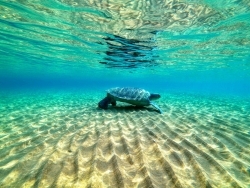 Valley City, OH, April 09, 2019 --(PR.com)-- The sea turtles of Cyprus are receiving international attention through a fundraising campaign set up to benefit the Marine Turtle Conservation Project, an organization conducting sea turtle research and conservation work. The fundraiser’s website explains the centerpiece of the campaign: organizer Sydney Lewis aims to raise awareness for the cause by shaving her hair. Sea turtle populations have been greatly impacted by climate change and human development and activities. Humans are the greatest threat to sea turtle survival. In an increasingly disposable world, forgotten plastic trash worldwide poses new dangers to sea turtles of all life stages. Through fishing by-catch, entanglement in fishing gear, accidental plastic consumption, and collisions with boat propellers, our impact on the environment is taking its toll, ultimately resulting in only 1 out of 1,000 sea turtles living to maturity. Lewis says she will be shaving her hair at the end of April, but that the fundraising will continue for as long as she is able to keep educating others about the sea turtles in Cyprus and the work that the Marine Turtle Conservation Project is doing save them. Donations are being collected through the a GoFundMe.com page titled "Shaving my Hair for Sea Turtle Conservation." The Marine Turtle Conservation Project in Northern Cyprus is a 25+ year partnership between Cyprus’ Society for the Protection of Turtles and The Marine Turtle Research Group of the University of Exeter. Through research and education they aim to increase nesting success and overall survival rates for the two types of sea turtles who spend time in Cyprus: threatened Loggerhead and endangered Green turtles. Each season, local and international volunteers for the project complete all aspects of data collection and conservation by spending time working directly with the turtles on some of the most important nesting beaches in the Mediterranean.